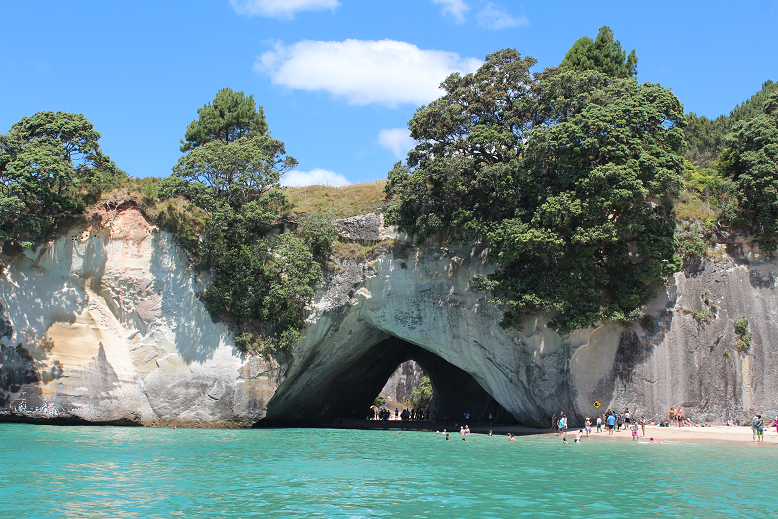 A two-hour drive from Cambridge took us to the small town of Thames at the start of the Coromandel Peninsular. We arrived too early to check into our motel so we headed to the supermarket and shopping centre instead to stock up. Afterwards we headed to a small park and let the kids play while we sat in the sun. 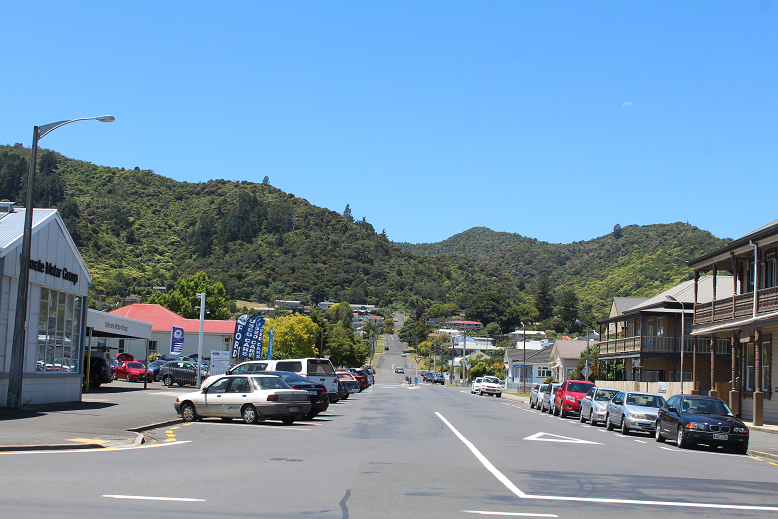 The Shortland Court Motel was not too far from the park, and after checking in we relaxed for the rest of the day. The following day we were still in Thames so we explored the town, went to the park and visited a small butterfly park on the outskirts of town. 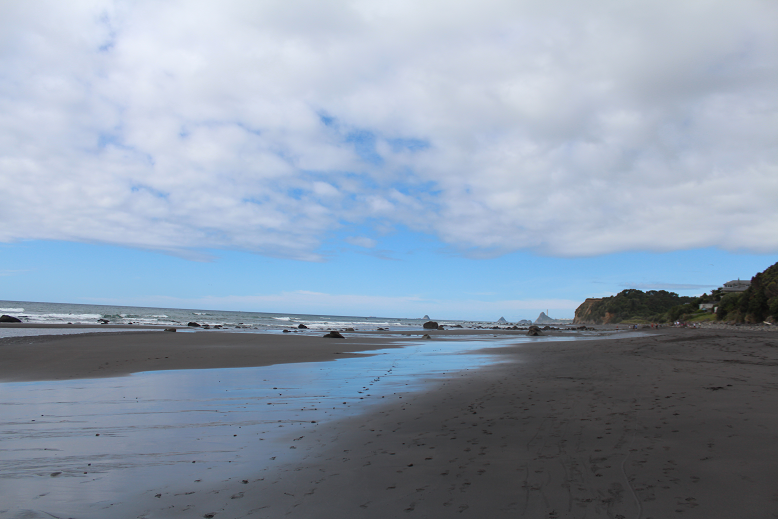 After rushing around visiting Waitomo Glowworm Caves and Hobbiton it was nice to slow the pace down for a couple of days. Leaving Thames behind we drove up the winding coastal road to Coromandel Town itself. Before we checked in to the Top 10 Holiday Park in town we parked by the small harbour and took a walk past some of the sailing boats and soaked up the sun. 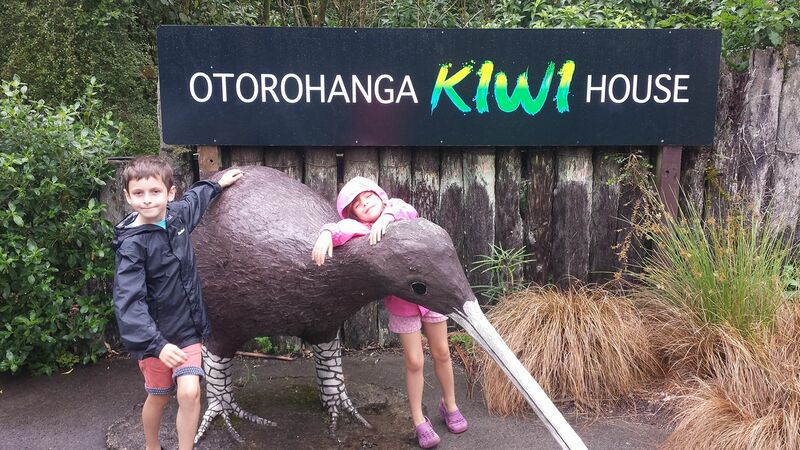 The Top 10 Holiday Park was just as good as the ones we had stayed at in Rotarua and Whanuangi. It had a swimming pool, bouncy castle and play park to entertain the kids. We pitched the tent and stocked up on groceries before we all changed into our swimwear and went in the pool. The kids then played in the park and the bouncy pillow with our son making friends with a boy from Waitomo. We cooked dinner and chatted to a few families and couples from the campsite before heading off to sleep for the night. Mum and Dad didn’t have a great sleep in the tent so were both very tired the next day. We had booked to go on a glass bottom boat. It was an hour’s scenic drive over hills to Whitianga and the town itself was beautiful. We had arrived early so we could have some lunch before setting off on the boat. There was a large park next to the jetty and the kids played until it was time to board the boat. Our boat could hold up to fourteen passengers and was full for the trip. We were introduced to Captain Joe and first mate Emily who would be our guides for the tour along the east coast of the Coromandel Peninsular. Captain Joe was a very funny guy and cracked jokes most of the way. 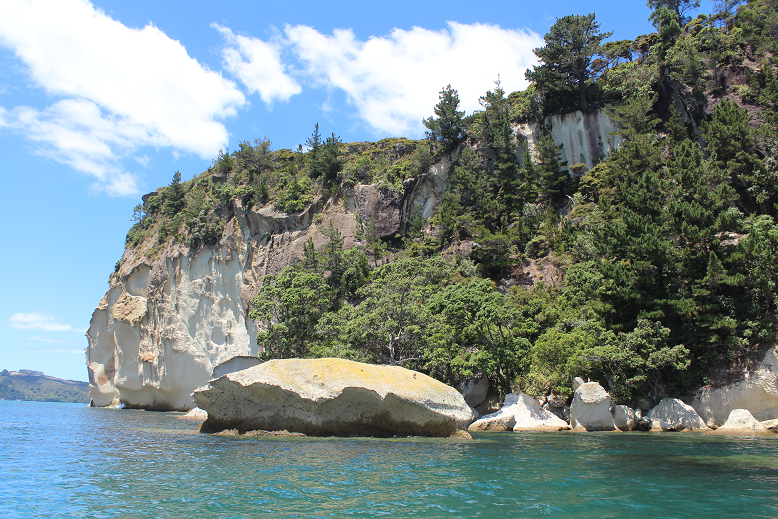 The captain and Emily showed us lots of landmarks, including Shakespeare Cliff where Captain Cook used the stars to accurately pinpoint New Zealand on the map. We made our way around the Coromandel Peninsular to Cathedral Cove, where plenty of tourists had flocked to the beach to have their pictures taken. Our family picture was taken from the back of the boat and then we headed off again. The floor of the boat was raised to reveal the glass bottom so we could observe the sea life below. We saw one stingray and a few fish, but other than that there was not much of interest below the boat. 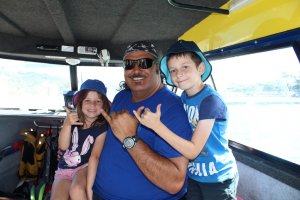 Some days the trip can luck out and see a lot of sea life and others not so much, unfortunately for us we were on a trip that didn’t see too much. We were still very satisfied with our trip and when we returned we spent a bit of time on the beach. Back at the campsite we cooked dinner while the kids played with friends before we headed to bed. Unfortunately, Mum and Dad did not sleep well again and a third night of camping before a long drive to Auckland didn’t seem too appealing. We decided to book a night in a motel back at Thames, a halfway point between Coromandel and Thames. Since we had paid for our camping pitch one more night we didn’t have to rush to check out. Instead we made the most of the great facilities on site before packing up and heading to Thames for a stay in the Avalon Motel. Mum had a good sleep when we were there and everyone else relaxed. 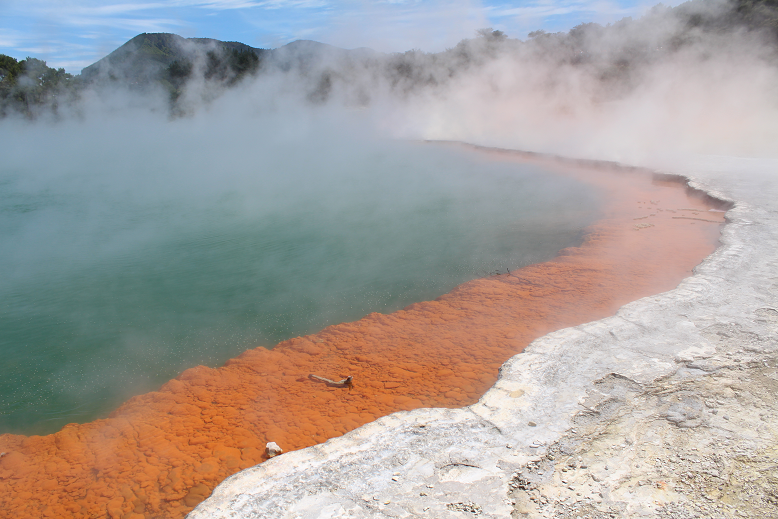 The following day we checked out, left the Coromandel Peninsular, and drove back to Auckland to drop off our hire car. We had one night booked back in Base Backpackers. Following check in we had lunch at the Elliott Stables, walked around Auckland and did some last-minute shopping.